Mike Quaglia was 42 when he was diagnosed with Parkinson’s disease, which gradually robs its victims of their ability to move normally. For the next seven years, his condition deteriorated despite medication. “I was at a point where I was either going to give up and let the Parkinson’s take over, or I was going to decide to fight back,” Quaglia says. Fight back he did — literally. Last February he stumbled on a program called Rock Steady Boxing. 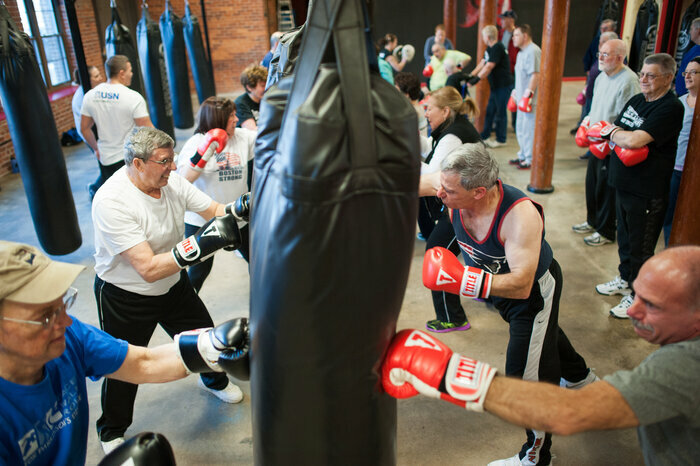 That’s right: It teaches Parkinson’s patients how to box. 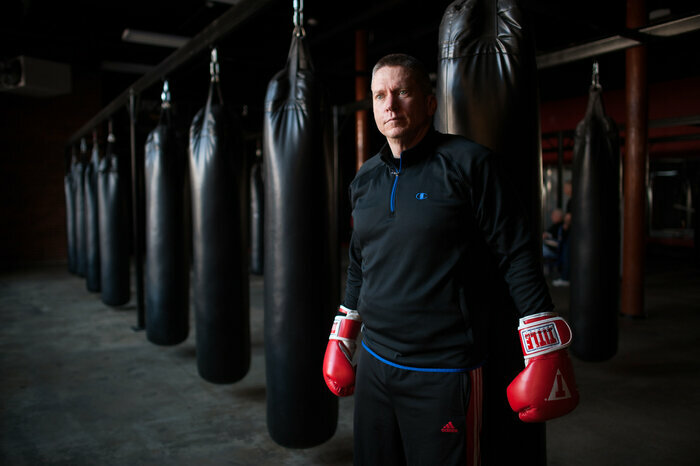 So now you can find Quaglia at Fight 2 Fitness, a gym in Pawtucket, R.I., several times a week, his hands encased in bright red boxing gloves. Alongside him are a dozen other Parkinson’s patients. They range from a 46-year-old mother of teenagers — she sports pink boxing gloves — to an 84-year-old former phys ed teacher who uses a wheelchair. They don’t punch each other. They’re hitting 100-pound punching bags when they’re not stretching or doing calisthenics. Parkinson’s disease afflicts about a million Americans — more than multiple sclerosis, muscular dystrophy and ALS combined. Every year 50,000 more get the diagnosis, a number that’s going up as the population ages. They face a gradual loss of control over their muscles, leading to tremors, loss of balance and difficulty walking or speaking. And boxing, it turns out, is only one of an expanding array of movement therapies gaining in popularity as antidotes to Parkinson’s. Other Parkinson’s patients are drumming, dancing to a Latin beat, practicing the ancient Chinese art of tai chi or golfing. Even patients with advanced disease can benefit. Jacobo Farina, 79, says he could barely move when he got up on the day of a recent drumming class for Boston-area Parkinson’s patients. But when the drumming started, he was one of the most energetic participants. “When you feel the music, your body — your spirit — it comes alive,” Farina says. Dr. Daniel Tarsy, director of the Parkinson’s disease program at Beth Israel Deaconess Medical Center in Boston sees meaningful change in a lot of patients who go into these exercise programs. Tarsy says patients often report that their movements become more fluid. That’s the opposite of the rigid, jerky movements typical of Parkinson’s. A 2012 study from the Oregon Research Institute and other institutions found Parkinson’s patients who did six months of twice-weekly tai chi had better balance and control over their movements and were less likely to fall than others who did weight training or stretching. The weight trainers had improved balance and fewer falls than those who merely stretched. Other recent studies show that Parkinson’s symptoms improve with cycling and treadmill workouts. Tai chi engages both mind and body; you might call it “mindful movement.” Wayne thinks it may help patients use undamaged parts of their brains to compensate for the areas that normally control automatic movements such as walking. But it may be that any kind of purposeful exercise is a tonic for the brain. Back at the gym, that’s how Mike Quaglia sees it. And then there’s the social aspect of it. Rich Gingras, owner of the Rhode Island gym where Quaglia boxes, says Parkinson’s patients often sit at home and get depressed. And after all, there’s nothing more therapeutic than a smile.